Huawei unveiled a new Li-Ion battery that can remain functional at higher temperature (60° degrees as opposed to the existing 50° limit) and offers a longer operation time - double than what can be achieved with previous batteries. To achieve this breakthrough, Huawei incorporated several new technologies - including an anti-decomposition additives in the electrolyte, chemically stabilized single crystal cathodes - and graphene to facilitate heat dissipation. 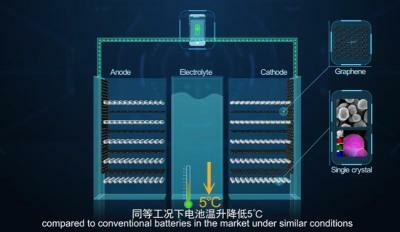 Huawei says that the graphene reduces the battery's operating temperature by 5 degrees. Huawei aims to use these graphene-enhanced batteries in cellular base stations, which could be now deployed without air-conditioning. it also says the batteries could find applications in drones and electric vehicles. In October 2015 we reported that Huawei aims to launch a research project to examine prospective applications of graphene to the information and communications technology sectors. Hauawei was said to collaborate with The University of Manchester's National Graphene Institute's, and invest millions of pound in this project.